Tomorrow, all across Oahu, volunteers will be taking part in the 30th annual Food Drive Day coordinated by the Hawaii Foodbank. Once again, management, employees, and contractors from the City & County of Honolulu joined in the effort to help make Food Drive Day a success. The HART Ohana was proud to be part of that effort and responded by collectively accumulating more than a half-a-ton of food donations, 1,202.4 pounds in all! T he HART Ohana also stepped up to chip in an additional $2,910 in monetary donations! Both of these totals will be adjusted with donations still being accepted from HART staffers through the early part of next week and an additional generous donation being made by one of HART's contracting companies! Janelle Tanna led the effort on behalf of the HART Ohana with assistance from Marissa Nishimura, Star Kitayama, Danelle Miyahara, Julie Ono, Sophie Fung, Dolly Moe, and Michael Tsuhako . There are some who continue to suggest that the Honolulu Rail Transit Project either pause or end at the Middle Street Station. HART Executive Director & C.E.O. 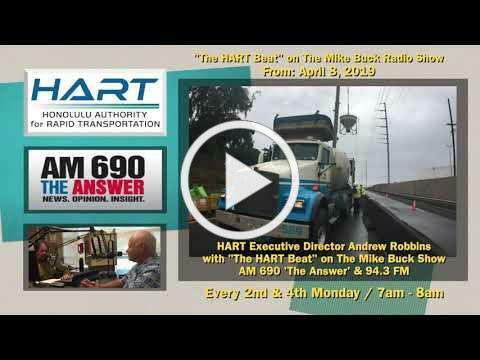 Andrew Robbins sat down with host Mike Buck during his daily radio program and discussed Middle Street, among other topics, on this week's "HART Beat" show. On the second and fourth Monday of each month, Robbins delivers "The HART Beat" during the Mike Buck Show. The program is dedicated to the Honolulu Rail Transit Project and allows listeners a chance to call-in and pose questions to Robbins & Buck. You can hear the Mike Buck Show on AM 690 and 94.3 FM "The Answer," every second and fourth Monday from 7:00am to 8:00am. The latest installment of the "HART Beat" can be heard by clicking here. HART Executive Director Andrew Robbins was an invited guest at this month's meeting of the Filipino Chamber of Commerce of Hawaii. With varying degrees of work currently underway along all 20-miles of the Honolulu Rail Transit Project, Robbins provided a progress report on station construction across the Ewa-end of the Project, guideway construction happening near Joint Base Pearl Harbor-Hickam, and utility relocation work going on all throughout the Project's City Center. Robbins also updated the Chamber on the City's long-term Transit-Oriented Development (TOD) initiatives and the potential benefits T.O.D. could provide. Both Robbins and Hannemann also discussed the prospect of rail, along with T.O.D. helping to revitalize areas like Waipahu, Kalihi, and Kaka'ako. CHECK OUT OUR LATEST CONSTRUCTION PROGRESS VIDEO! 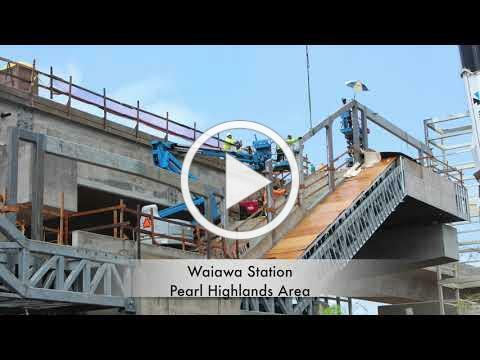 The Honolulu Authority for Rapid Transportation recently put out its latest construction progress video, encompassing active construction from January through March of this year. As there are with hurricanes, there is no season for tsunamis. But like hurricanes, tsunamis can cause catastrophic damage and sometimes, with little or no warning. April is Tsunami Awareness Month in Hawaii and the Hawaii Emergency Management Agency (HI-EMA) is encouraging the public to be proactive and to prepare now in advance of the next tsunami. Hawaii's geographic position in the middle of the Pacific makes the state extremely vulnerable to the threat of tsunamis. And although, depending on location, an earthquake-triggered tsunami can take several hours before it impacts our shores, officials urge people not to wait until a tsunami advisory is issued before taking action. Now is the time to plan and prepare for the next tsunami. Tsunami waves may keep coming for hours, with waves arriving every 10 minutes to one hour apart. The first wave may not be the largest. Tsunamis travel as fast as a jet airliner (approximately 500 mph) in the deep ocean with waves only a few inches high. As tsunamis approach the shore they slow down but increase dramatically in height. Tsunamis strike with devastating force and quickly flood all low-lying coastal areas threatening life and property. Historically, locations in Hawaii have been flooded with water more than 30 feet deep. Tsunamis are usually caused by shallow, undersea earthquakes. Tsunamis are less frequently caused by underwater volcanic eruptions, landslides, slumps, and meteorites. Homes and small buildings are not designed to withstand tsunami impacts. The City & County of Honolulu and the Department of Emergency Management has put together a list of facts and important information about tsunamis and tsunami preparedness, click here to view.